1) Hollywood's half-assed attempt to capture the counter-culture. Dig that pad, man! As Eastwood's Deputy Sheriff Coogan experiences it, the NYC scene consists of squeaky clean hippie guys attacking him to the sounds of bad acid rock, while young, nubile & body-painted chicks high on drugs and free love throw themselves at him. 2) The '68 fashion. 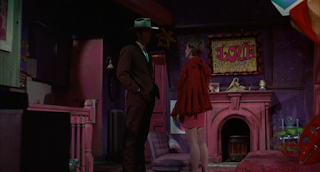 My favorite is this all-red number worn by Eastwood's potential love interest Susan Clark wears at the very end. Don't have a screenshot, but believe me: everything, boots to coat, is candy-apple red. 3) A chase scene. Around Fort Tryon Park. On Motorcycles.